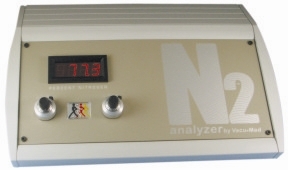 The model 17750C is a stand-alone Nitrogen gas analyzer, fully solid-state with proven ionization technology and years of reliable performance. The technique is essentially a photospectrometer. As the sample passes through the sample chamber, it is ionized, selectively filtered and detected by a photocell. It offers rapid response time for breath-by-breath applications and a calibrated analog output for strip chart recorders or computer interfacing. It is supplied as a complete system, pump included (Pump not shown). Calibration is simple using 100% oxygen as the zero gas and room air as the nitrogen standard. A hand-held digital vacuum gauge to be assured of proper vacuum and leakage troubleshooting. Warranty: 1 year parts and labor, details in FAQ. To read the (old) User Manual Click here to open a PDF file.